← The Night They Drove old DADT down! An interesting thing about the English language is how many words sound exactly alike (or almost exactly), but the distinction in meaning is in the spelling. Here is a great example – bridal and bridle. When you think about the distinction in meanings in these two different words and look beneath the surface, the connection between the two comes into almost shocking perspective. To bridle means to curb, to bring something under control – how is that much different than what happens to the bride (in many if not most instances)? 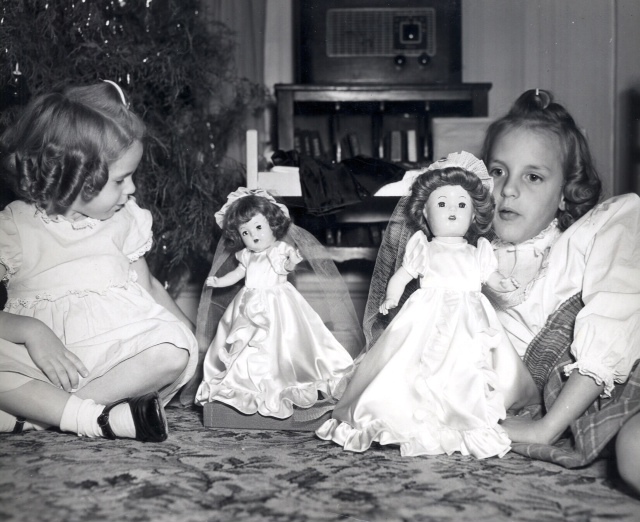 In the photo here, my little sister and I are contemplating the dolls we received for christmas when we were 4 and 7. Of course you can interpret the meanings expressed in this photo in many different ways. To me the look on my face more or less says it all .. not particularly overjoyed to say the least – more of a vacuous resignation. Even though I certainly got the message that was intended in the doll’s attire little did I realize that the symbolic meaning was actually to bridle what I, as a girl child, was destined to live out in my life. Nor could I ever have imagined then that within a couple of short decades my persuasions toward women would turn in directions that my parents, and society at large, would choose to not only bridle, but literally snuff out like a burning candle. Indeed the bride dolls in the photo could well have been dressed in the typical nurse’s uniform of the 1940’s and they would have conveyed much the same imagery. At least a nurse doll would have represented a small, but significant aspect of potential for a woman that was far from the ideal that my parents intended for me and my sister – a woman capable of contributing to the well-being of society and of earning her own way in the world. Thankfully, nursing has moved far beyond what it was in the 1940’s and the struggle to gain a more accurate social image of who we are and what we contribute has made a difference. There is still a significant challenge to fully unbridle our abilities, but it is happening! And hey — I wrote an article addressing the stigma of homophobia in a nursing journal! This is truly something that my little 7-year-old self could never have dreamed possible! This entry was posted in Feminism, LGBTQ, Making change, Politics, Reflections, Social Issues and tagged Homophobia, Issue in Mental Health Nursing, lesbian nurses, Nursing. Bookmark the permalink. I well remember as a child the consternation of my parents and others when I exhibited a far from masculine interest in not only dressing my female friends dolls, but actually designing and making new clothes for them too. Who knows… I might even have been another John Paul Gaultier (or Dior perhaps, since my ”creations” were always somewhat more conservative) if my creativity hadn’t been stilted as a youngster. How many creative people have been stifled by gender stereotyping? I still enjoy sewing and find it deeply relaxing, and my ‘mother-in-law’, who used to be a seamstress in a well-known Paris fashion house thinks that I am pretty good at it which I take as the ultimate compliment. If only I had been left to my childhood pleasures. I might have ended up with my own atelier in Paris instead of sewing buttons on the shirts of a French seamstress’s son! totally “right on!” thanks so much for sharing!